Render is a courthouse facility dog at the Fannin County Children’s Center. 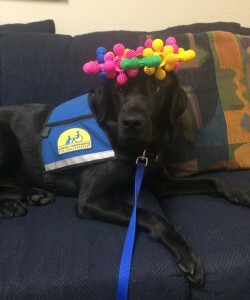 In this photo he is wearing a crown made by a child who came to the center for a meeting with her advocate and attorney. The Fannin County Children’s Center has a new staff member with four legs. His name is Render and he is a courthouse facility dog. Render is two years old and a mix of Labrador and Golden Retriever. Render is a professionally trained facility dog who works with children. He is a gift to the Children’s Center from Canine Companions for Independence. He knows more than forty commands and has been prepared his whole life for his special job. He provides comfort and courage to children by laying quietly at their feet while testifying in court or next to them during forensic interviews and counseling sessions. CAC Program Specialist Mandi Bruso is Render’s primary handler and who he lives with. CAC Program Director Kassi Lightfoot is also a trained handler. Bruso and Lighfoot completed two weeks of intensive training this summer to learn how to handle Render. Last month, representatives from Courthouse Dogs Foundation came to Bonham to train all of the judges, attorneys, CAC multidisciplinary team member, CASA volunteers and Children’s Center staff who will be working with Render. Local donations from individuals covered the costs for this special training, as well as for food and supplies for Render. Local veterinarian Dr. Eve Germone has graciously donated her services for Render’s medical check-ups. Local photographer Kassie Rogers donated her services to take professional photos of Render. One of the photos she took now graces the cover of Render’s cards that resemble a baseball card. Staff and others have already seen what a difference Render can make with children. Over and over again staff have observed children and teenagers who come to the center anxious, reserved, upset or even angry and then become calmer and more talkative once they meet Render.